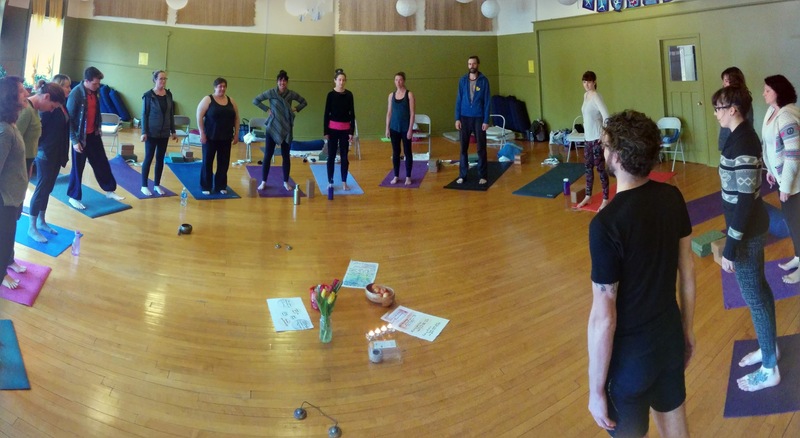 This guest post is by Christine Witmer Lang, a long-time yoga and meditation practitioner, a member of QSY’s 2015-2016 Yoga Teacher Training program. Before I began Yoga Teacher Training, I admit I spent very little time thinking about the broader social and cultural aspects of yoga. Like many things that come into our lives, I came to yoga aware only of what this practice could do for me. I enjoyed the challenge of the physical movement through poses, the integration of breath, and the continual invitation to be aware of how my body felt as it moved through a sequence. Yoga gave me a sense of embodiment and calm, which over time permeated into other parts of my life. Through yoga, I believed I had found a home. Yoga made my life better, my body stronger, and my mind clearer. It felt as though yoga had been made for my body and temperament – as if yoga had been made for me. 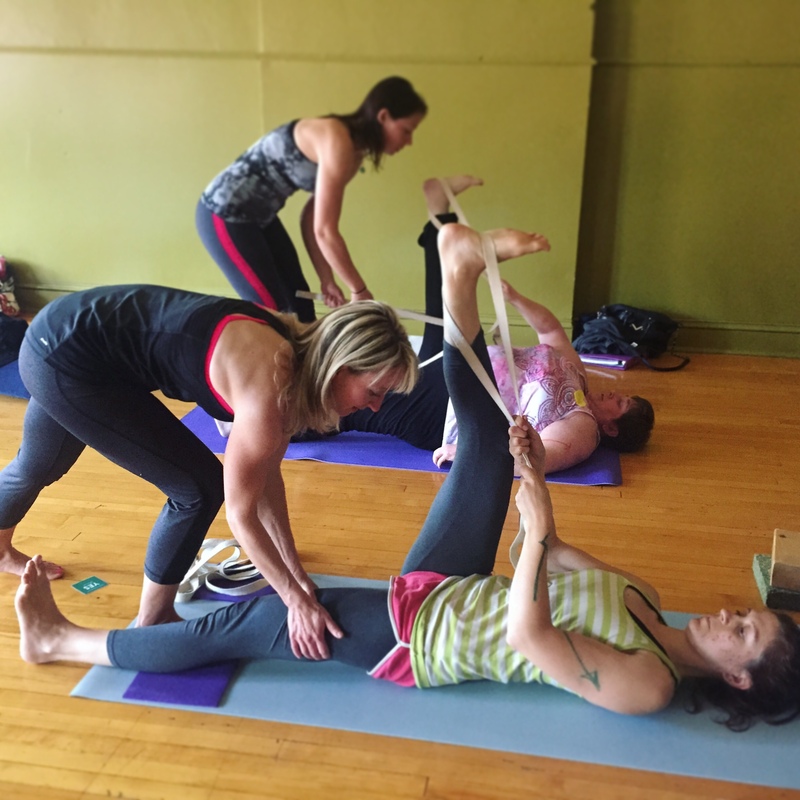 Through discussion on yoga teacher training weekends, through readings, videos, and workshops, I’ve had to come to terms with the fact that yoga has a history and cultural complexity that extends far beyond our North American understanding of its practice. The very practice through which I learned embodiment has been cut off from its roots, and has suffered a disembodiment of its own. 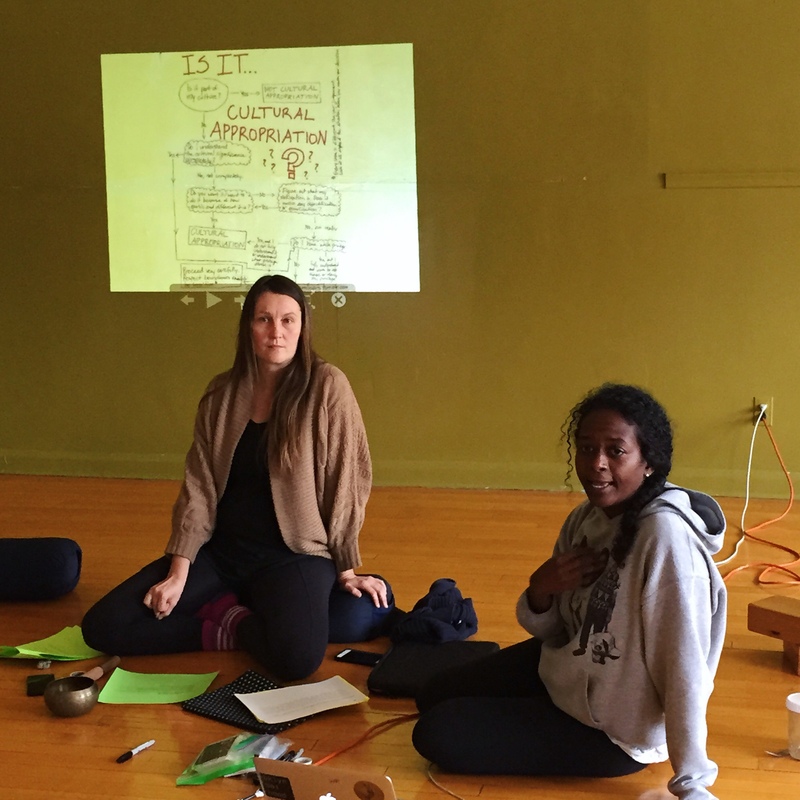 When Christi-an Slomka and Jamilah Malika came to speak on “Yoga, Social Justice, and Anti-Oppression”, my goal was to listen with an open mind and an open heart. It’s been my experience that in this way I can combat my natural and human reaction of defensiveness and denial. Certainly I don’t want to hear that yoga is not something that is mine. I don’t want to have my right to it challenged. I don’t want to accept that practising yoga without giving proper homage to its origins is practising a disembodied yoga, a shadow of itself. I don’t want to believe that while I love my yoga, the fact that I see it as ‘my yoga’ may make others feel unwelcome and marginalized. I have to say I know what she is talking about. There have been many times when I have turned away from something uncomfortable, allowing myself only a vague notion that I was being complicit in my own ignorance. When you have the force of society’s dominant culture behind you, it’s easy to turn away from things you don’t want to see, and allow yourself to be swept away from it. I understand why so many of us work hard to keep our perception of our world the way we want to see it. If we take those clothespins off our noses, we have to acknowledge that yes, something stinks. Life is lovelier if I don’t have to acknowledge others’ perspectives of the world we share, especially when others’ experiences challenge my right to live the way I live. It’s far easier to create a narrative where others are just not trying hard enough, or they are too sensitive, or they are misunderstanding in some way. Taking that clothespin off my nose is uncomfortable and hard, and forces me to be witness to experiences I don’t want to be witness to. It forces me to listen openly to others when they tell me about their painful experiences. We’ve been privileged to be able to choose not to deal with these issues, but that privilege comes at a cost. It comes with the exclusion from yoga of a huge segment of our population, of our neighbours and friends and co-workers who just don’t feel welcome or comfortable in the North American yoga world as it currently is.They don’t feel comfortable because they don’t see themselves reflected in the teachers. They don’t feel comfortable because, while they may be from the country yoga originated from, they don’t recognize the yoga being practiced. They don’t feel welcome because we’ve created yoga spaces that appeal to exactly the type of people who are exactly like us. And we lose something, too. We lose connections and the richness that comes with opening ourselves to people who see things differently from us. It’s a huge price to pay. I know that I have no answers, and I probably never will. It’s a process of continually keeping myself open, and of humbling myself, and of releasing everything I think I know, over and over. But what I do know is that in this place, in this space of being humbled and emptied, in this place of not knowing, of discomfort, and of questioning – in this messy, beautiful, difficult, glorious place – is a yoga worth practising, worth teaching, and worth living. It’s not a yoga that was made for me. But it’s the yoga that I want to share.